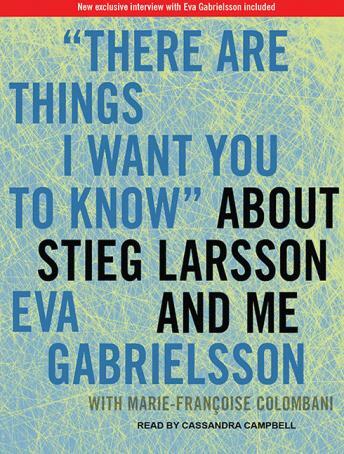 There is only one person who can tell Stieg Larsson's story better than he can, and that is his lifelong companion, Eva Gabrielsson. This is her book. The keys to the 'Stieg Larsson phenomenon' all lie with Stieg Larsson the man. No one knew him like Gabrielsson. Here, she tells the story of their 30-year romance; of Stieg's lifelong struggle to expose Sweden's neo-Nazis; of his struggle to keep the magazine he founded, Expo, alive; of his difficult relationships with his immediate family; and of the joy and the relief he discovered writing the Millenium trilogy. Above all, this is a love story, and we come to understand, reading 'There Are Things I Want You to Know' About Stieg Larsson and Me, that if there was another secret besides Larsson's own imagination and convictions, it was his absolute love for his companion and her nurturing of their privacy and shared passions. The book is told as a series of short vignettes, with titles ranging from 'Speaking of Coffee' and 'Stieg's Journalistic Credo' to 'Goodbyes' and 'The Fourth Volume.' Gabrielsson speaks with rare candor and dignity, inspired only by the truth as she knows it. 'There Are Things I Want You to Know' About Stieg Larsson and Me is thus short and to the point, poignant in its account of two soulmates and the life they shared and deeply insightful into the man everyone wants to know better, and about whom so little is known. 'I would have preferred to have never written this book. It speaks of Stieg, of our life together, and of my life after his death,' writes Gabrielsson early in her book. It was written because she alone can tell his story.